This sometimes too clever for it's own god thriller stars Elijah Woods as Martin, a young man returning to university in order to advance his academic career. At Oxford, Martin seeks the tutelage of Arthur Seldom (John Hurt), a stuffy no prisoners type attitude professor who prefers his mathematic research as opposed to human company. Attempting to convince Arthur to assist him with his thesis, the unlikely duo soon form an uneasy friendship upon the discovery of a body of a mutual friend. Pushing their differences aside, both start their own amateur murder investigation as they collect the clues and narrow their list of subjects. Unfortunately their investigation is hampered by another murder. There are also two women interested in Martin, a musician (Julie Cox) and a nurse (Leonor Watling) which lead you to believe that there may be ulterior motives as opposed to just a flirty relationship but at times, these relationships feel too forced with no real explanation. Even so, the storyline does work for the majority of time and Hurt and Woods are excellent actors. It should be mentioned that this sometimes predictable thriller is based on the novel by Guillermo Martinez of the same name which attempts to draw the viewer into this mystery on one of the worlds most prestige universities. The director does a good job at setting up certain plot lines with it's theories and suspenseful moments that try to throw the characters off the trail but also a few aspects that unfortunately make no sense whatsoever. The lead actors do get into headspace of their characters well, especially Hurt but both are a little let down by the sometimes overcomplicated script. 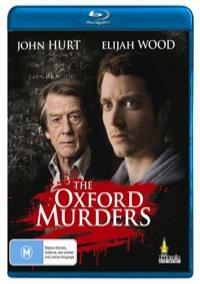 The Oxford Murders looks good on Blu-ray with sharp images and strong blacks. There's some great detail on full HD, especially seeing the close-ups of the actors like Mr. Hurts well travelled face. Another highlight of the video is the wonderful cinematography and architecture of the locales that truly adds to the mystery. Audio supports 5.1DTS-HD that is mixed well with clear dialogue and a nice mysterious musical score to compliment the story and the characters. In terms of special features, The Oxford Murders contains a behind the scenes featurette or making of and the original theatrical trailer. A little lacking when compared to other Blu-ray releases. In the end, Oxford Murders is a decent attempt at a thriller that works in some areas and fails in others but it's still worth a watch, especially as the viewer attempts to pick up the clues, alongside with the characters.